Chocolate Covered Strawberries are an easy, elegant treat when entertaining. 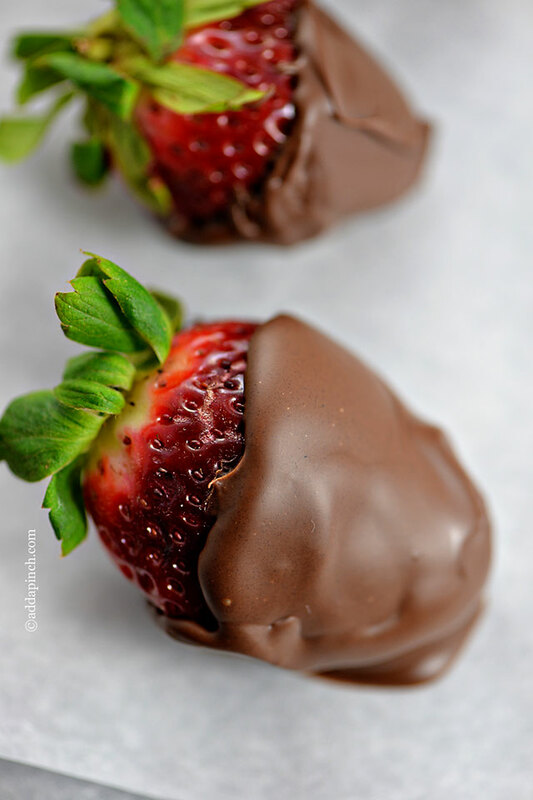 This chocolate covered strawberries recipe you can make at home is simple and delicious! 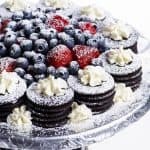 They make such elegant little additions to any party or when entertaining. But don’t let the decadence of these chocolate covered beauties fool you! They couldn’t be any easier to make if you tried! I guess that’s why I make chocolate covered strawberries as often as possible! For my chocolate covered strawberries, I like to use absolutely the best tasting, juiciest, most delicious strawberries. It makes all the difference in the final result to me. Chocolate Covered Strawberries make such a special handmade gift for someone you love. They are perfect for holidays such as Valentine’s Day and Mother’s Day, parties and showers and for giving to a close friend. They certainly make an impressive statement, yet they are so simple to make! 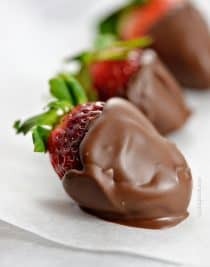 If you are only making a few chocolate covered strawberries to enjoy or for a small party, you can simply use the microwave or cooktop for melting the chocolate for dipping the strawberries. This easy method is great for making these anytime the you want them! But, if you are making a large quantity, I recommend using a fondue pot to make it easier on yourself. The fondue pot keeps the chocolate at the perfect temperature for dipping the strawberries so that you aren’t constantly heating and reheating the chocolate as you work. It’s a game changer for a routine chocolate dipper like me. These are also so much fun to make in the fondue pot with your family or a gathering of close friends! Here’s my Chocolate Covered Strawberries recipe. I know you’ll love them! Chocolate Covered Strawberries are an easy, elegant treat when entertaining. Get this simple recipe for chocolate covered strawberries you can make at home. Line a rimmed baking sheet with parchment paper and set aside. Dry strawberries well with paper towels to make sure chocolate adheres perfectly. Heat chocolate chips and coconut oil in microwave safe bowl for 2 minutes on 50%. Stir until smooth. 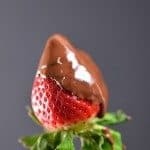 Dip each strawberry into the melted chocolate, making sure the strawberry is covered almost to the stem. 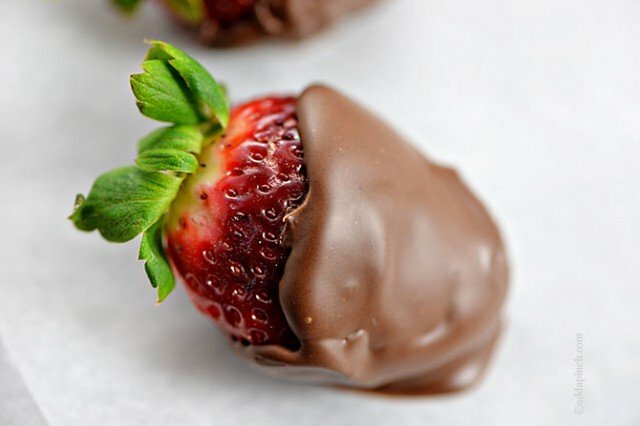 Place chocolate covered strawberry onto parchment lined baking sheet and place into the freezer for at least 15 minutes to set. Store in the refrigerator for up to 2 days. Store in an airtight container in the freezer for up to 3 months. For a large quantity, melt chocolate and coconut oil to an electric fondue pot, stirring until smooth. 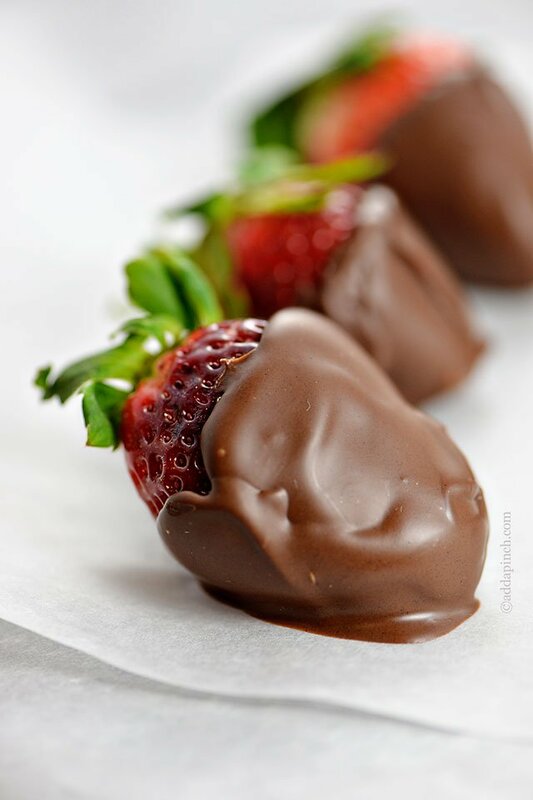 Keep chocolate warm while dipping all strawberries. Follow remaining directions for storing. What kind of coconut oil do you prefer?? I generally use an organic coconut oil made by Spectrum from my local grocery store. There are various brands of coconut oil available though. I think this is a great recipe. I use organic coconut oil as well. I like the hint of coconut flavor it gives off. These look so luscious! But, where do you find good strawberries this time of year? Thanks. Thanks, Mary. The produce section in my grocery store has had beautiful strawberries lately. Good luck! They’ve been so delicious, too! Robyn, for more than 20 years I have made these using 1/2 dark and 1/2 milk chocolate. EVERYBODY loves them, not too dark or too sweet. And while I understand using coconut oil I think the option of using vegetable shortening would keep anyone from having to buy a very large and expensive container of coconut oil.. it is only 2 t. after all. Great point, Pat. Yes, if you’d rather use vegetable shortening in place of the coconut oil that definitely works. Where’s the milk added in ? I’ve never made chocolate dipped strawberries. It sounds delicious and addicting. This recipe doesn’t include milk. Hope you love them! Hi Nancy, That threw me for a second too but realized it was milk chocolate chips or dark chocolate chips. Glad I wasn’t alone on that. Great idea to use the fondue pot! Chocolate covered strawberries are irresistible! Chocolate and strawberry…What’s not to love? I love using coconut oil in my cooking, such a versatile and tasty fat. You just can’t go wrong with strawberries and chocolate (champagne optional). If you’re a coconut lover, it’s also nice to then dip these in toasted, shredded coconut. Yes please! 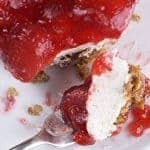 Such an easy, fun, dessert! When using a fondu pot what setting do you use? I generally keep the temperature as low as possible. For my electric fondue pot, I use setting 1 or 2. 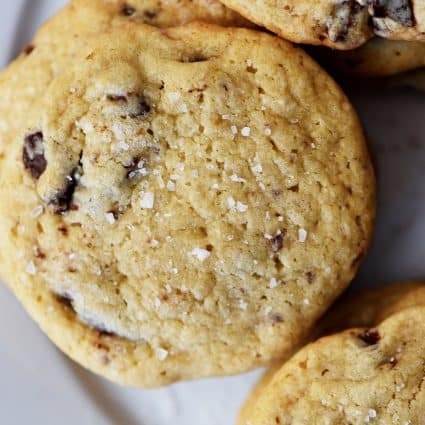 Love this recipe, but am little hesitant about freezing them. Do the strawberries not become a little mushy? Also, to respond to the reader who noted the expense of coconut oil for only 2 tsp. I am now using organic coconut oil as the best skin moisturizer ever. It is especially wonderful for chapped lips and dry hands and elbows. Just FYI. 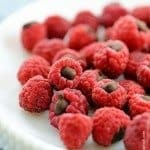 The 15 minutes in the freezer is just long enough to set the chocolate, not freeze the fruit. Thanks for the fondue tip , I wonder if a slow cooker would also work. 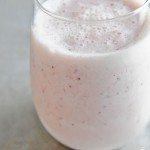 The bananas also taste yummy with this recipe! Why use coconut oil? Just wondering because I have never done that. I’m sure it is for a good reason and would like to know why. What a wonderful recipe, I enjoyed it and more to meet. Your website has many good recipes, congratulations for the work. Robyn, I love your recipes. I make these and if I have to set the chocolate I find that the refrigerator for a just a few minutes does the trick. Also, these are best when eaten right away which doesn’t seem to be a problem in my house. My favorite is milk chocolate. Have you ever made them with white chocolate? Ooh, this sounds perfect for Valentine’s! Your recipe states you can freeze for up to three months. Are they not mushy afterwards?? ?